Caleb Hampton Aldridge was the oldest brother of my Great-Great Grandmother, Frances Julina Aldridge Davis. He was the son of Henry Garner Aldridge and Priscilla Murray Aldridge, otherwise known as Garner and Prussia, while Caleb Hampton was better known as "Hamp". He was named for Garner's father Caleb Aldridge, Jr., the progenitor of the Aldridge family in Stanly County, North Carolina. Hamp was born in 1843 and died in 1912. He was married twice, to sisters. First, to Sophia Floyd and second to her sister, Elizabeth "Betty" Floyd McSwain Aldridge, a widow. They were daughters of Josiah Floyd, Jr. and Sarah "Sally" Easley Floyd. This is the first page of Hamp's family Bible. It is very old and hard to read. 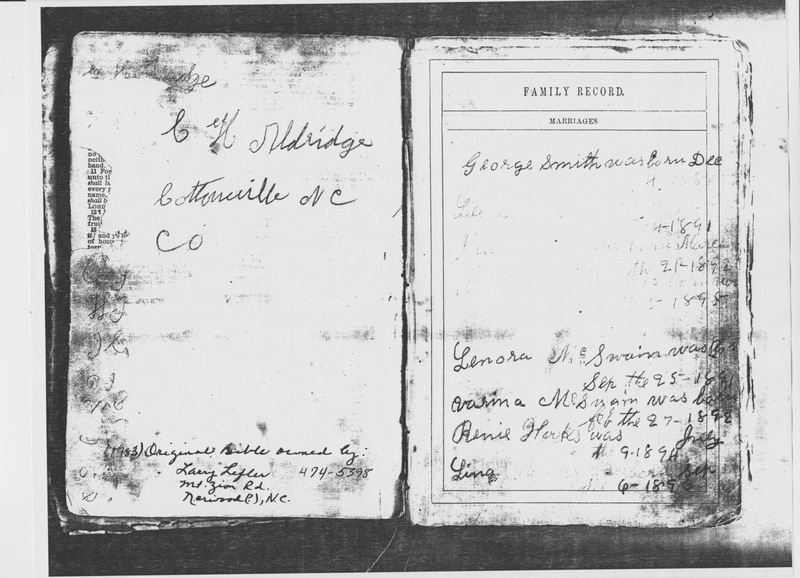 On the left it says "C H Aldridge Cottonville, N C . I am not sure what the CO means or of the intials on the left. It could be information that was recorded and faded away. I have copies in dark and light. Some of the images are readable in one light and not the other. The left side starts with George Smith was born Dec 4 1888. These are legible on the dark print, which does not copy well, but not on the lighter on. These were children of Martha Ella McSwain Smith, daughter of Hamp's second wife Bettie, by her first husband John C McSwain. The next four listed names are the daughters of Ella McSwain Smith's daughter Inez C. McSwain, and are also the grandchildren of Hamp Aldridge, as he was the father of Inez C. McSwain. 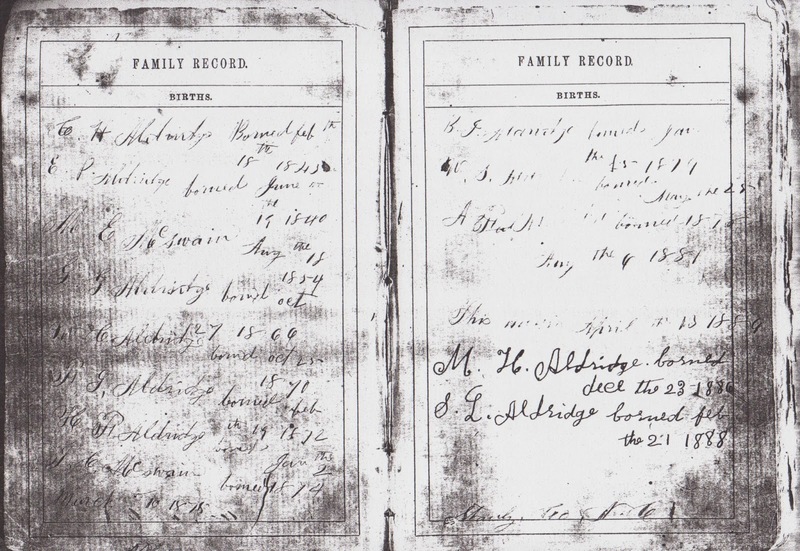 The second page must have been older than the first, as it lists the children of Hamp Aldridge and the first page listed grandchildren. E P Aldridge borned June 19 1840 (this is referring to Elizabeth "Bettie" Aldridge, his second wife). M E McSwain bornd Aug 18 1854 (this is Martha Ella McSwain, daughter of Bettie, mentioned above). Across the bottom of the page he scrawled "Stanly County NC". The Caleb Hampton Aldridge Bible gives an accurate listing of all of his children and some of his grandchildren. Without it we would not know there was an M. H. Aldridge. What I know about Julia.